Community members gather at the Newark Shopping Center to begin a slow ride through and around town and then get together afterward at one of the local restaurants on the first Friday of each month (except in Dec., Jan., and Feb.). First Friday Rides begin promptly at 6:00 p.m. (must have bike lights for dusk and after-dark rides during those times of year). Next event: See First Friday Rides page. 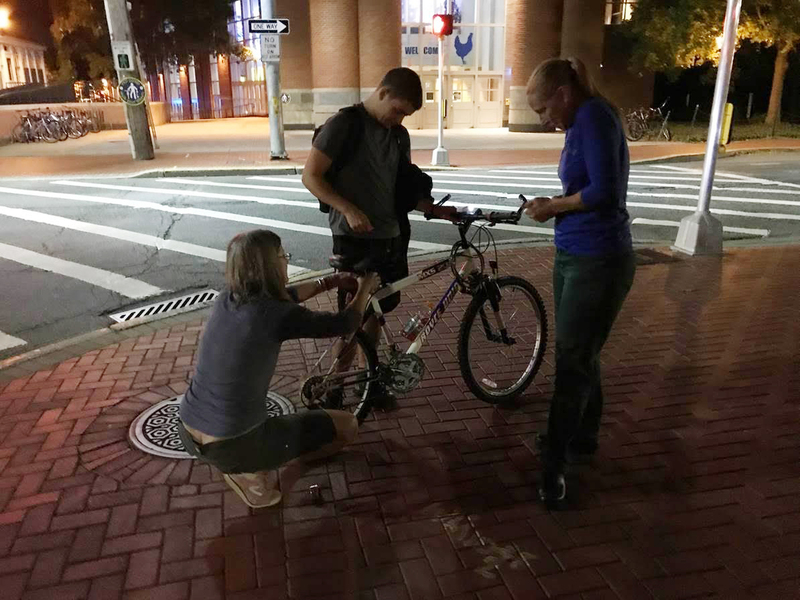 Each semester and during UD’s 1743 Welcome Days, BikeNewark works with partners DelDOT, the Newark Bike Project, the University of Delaware, and WILMAPCO to offer quick bicycle check-ups and quick fixes, install free bike lights, register bikes, and handout safety literature. Bike Lights Night is much like Bike Central, except that its main purpose is to focus on installing free bike lights at night for those who are biking without proper (and/or legal) illumination. The idea is that several volunteers stake out a downtown location and watch for bicyclists who don’t have lights, flag them down, do a quick bike-light installation, and then send them on their legal way. BikeNewark, along with partners UD, DelDOT, City of Newark, WILMAPCO, and the Newark Bike Project, organizes and presents a local celebration of National Bike to Work Day, the 3rd Friday morning in May, from 7:45–9:00 a.m.
Bike to Work Day this year will be held on Friday, May 17. The 2018 Bike to Work Day was a big success. BikeNewark supports Newark schools who participate in National Bike to School Day or a weeklong event. Each year John R. Downes Elementary School holds a Bike to School event to encourage young riders to use their bicycles to get to and from school. Held during National Bike Month (May), the 2017 Downes Bike to School Week event was a big success. See the Bike to School Week page for this year’s event. We invite other local Newark schools interested in developing National Bike to School programming to contact us for support. Each year BikeNewark helps support the organization of the Mayor’s Fun Ride, a pair of community rides with Newark’s mayor, staged at the Newark Shopping Center on a spring Saturday morning. Proceeds from this event help support the bicycling community. Next event: Saturday, June 1, 2019 10 a.m.
Partnering with the UD groups, BikeNewark helps promote bicycle civility and organizes a week-long series of events and contests called “UD Bike Days,” aimed primarily at University of Delaware students, faculty, and staff. The purpose is to promote safety and civility on UD and Newark’s roads and paths. See UD Bike Days for details. This local City of Newark event is held annually on The Green at the University of Delaware, usually the 3rd Sunday in September from 11 a.m. to 4 p.m. BikeNewark typically operates a booth and interacts with the community during this event, handing out material and soliciting feedback. 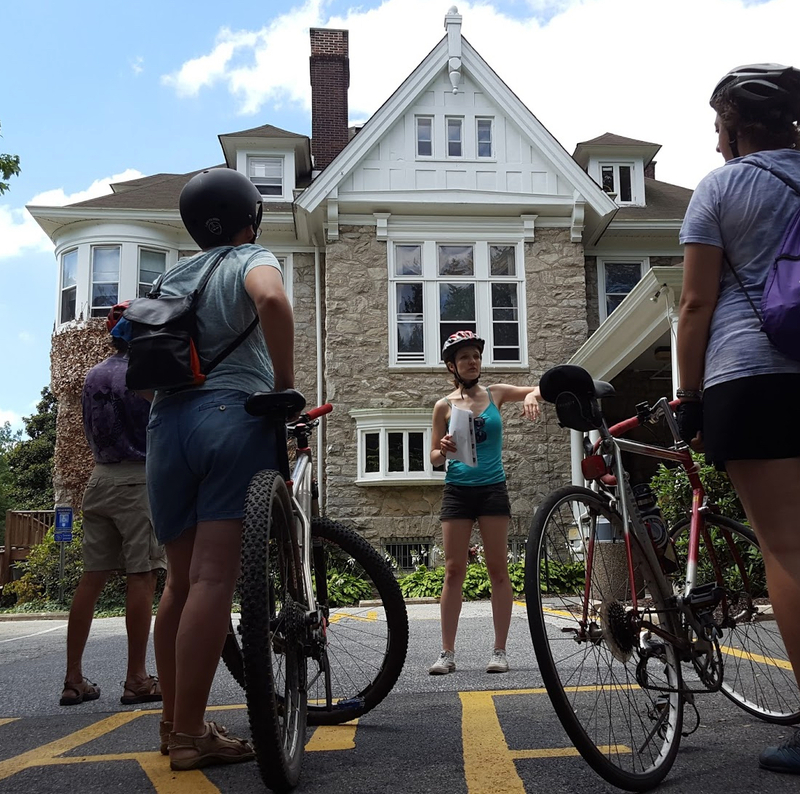 This five-mile bike tour, administered and co-sponsored by the Newark Bike Project, features 20 of Newark’s historic buildings. Community tour guides discuss the histories of Newark and of each building, as well as the buildings’ architectural features. For more details, see the event page.